He has written two trail guides. 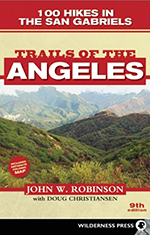 The first edition of Trails of the Angels: 100 Hikes in the San Gabriels was published in May 1971 and has been continuously updated and in print since then, now in its ninth edition. 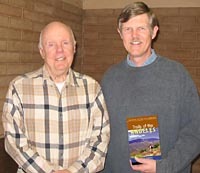 In 1972, Robinson published Trails of the San Bernardino Mountains, which also has been continuously in print. I heard Robinson say that for many years he would spend his Saturdays doing research for various local history books he was writing, and Sundays re-hiking the various trails for updating his guidebooks. He had in mind to also write a hiking guide for the Cleveland National Forest, but realized that keeping the other two books up-to-date was a big enough task. Robinson also has written a number of books on local history. His book The San Gabriels: The Mountain Country from Soledad Canyon to Lytle Creek (Big Santa Anita Historical Society, 1991), is rich with history and beautifully illustrated with hundreds of great old photographs. On April 25, 1995, I purchased my first copy of Trail of the Angels (Sixth Edition, January 1990). It quickly became my primary guidebook for hiking the San Gabriels. Several years later I somehow misplaced my copy so ended up buying a new one (Seventh Edition, September 1998). Then I found my old one, which was good, because I had a lot of notes in it. In February 2006, I decided to pick up a copy of the new edition (Eighth edition, April 2005, now with Doug Christiansen). I didn't really need it for myself, but bought it for a reference as I promoting hiking. The Ninth Edition was released in July 2013. I got a copy when it came out but have not had a chance to do a detailed review of it. The book continues to improve as they work on accuracy and address changes in trail conditions. Doug Christiansen admitted to me that one of the struggles they had was with all the closures relating to the 2009 Station Fire. Many of hikes in the book are in areas that were still closed at the time of printing. But the publisher wanted to keep the hikes in rather than swapping them for new hikes. So in Doug’s words, “Too many hikes state “check with the forest service.” But they did the best they could to keep the classic book intact while addressing the various closures. The new edition has 260 pages and retails for $18.95. The book begins with an interesting, 13-page section providing an overview of the mountain range and history of humans in the San Gabriels, and a then presents six pages of hiking tips, information about maps, and using the book. Then they present the 100 hikes. - Topo Map (USGS Quadrangle). Gives an overview of the hike and tells something of what you will see, such as type of scenery, and gives some historical background. As a writer of local history and one of the foremost authorities on the history of the San Gabriels, his hike write-ups are rich with wonderful historical background. Gives directions for driving to the trailhead. Then provides a detailed description of the walking route. Unlike the brief, bare-bones descriptions of some hiking guides, Robinson's writes-up are detailed enough to give the reader confidence that he or she can successfully navigate the route. And his graphic description helps you to visualize the hike before hand, assisting you in making choices about what trails to hike. Robinson's colorful and picturesque writing style makes for enjoyable reading. His trail descriptions are generally accurate, but sometimes his mileages and elevations are amiss. He sprinkles in photos throughout (74 in the eighth edition), including many photos of the past. I appreciate how Robinson treats the hike names, including not just the destination but also the trailhead and key and/or key geographic sites. This approach makes it much easier to skim through and look for hikes and more quickly recognize the routes. I wish he would include the peak elevations on all the peak hikes. He does on some but not others. For example, on Hike 29, Mt. Disappointment and San Gabriel Peak, he gives the elevation for Mt. D. but not for San Gab. His Seveth Edition map does not have the peak eleveations, but they've added some of the eleveations on the Eighth Edition. I love his map. It folds out to 38" x 18 3/4". On one side is a full map of the entire San Gabriel mountain range with topographical shading, labels of key features, and trails lined in red and labeled with the hike numbers. On the other side are shaded topo maps (80-feet contours) of five key areas. His also includes on the map an index and a list of the 100 hikes. One drawback: If you loose or wear out Robinson's map, it costs half the price of the book to replace it. And all the public library copies I've seen don't have the map. In contrast, Schad prints simple line maps in the book for each area. So his maps are not as helpful, but you won't loose them. I found the content changes between the two editions are negligible, as far as I can tell. He did a little re-numbering in the mid 50s, and replaced hikes 89 and 93. I was disappointed about the design of the new edition. The previous size was 4 1/2 x 7 1/2, making it real handy to carry along on a hike. The next edition was 5 1/2 x 8 1/2, too big to easily carry. The previous edition started each hike description on a separate page, making it most convenient to use. The new edition started the descriptions wherever they fall on the page then often wrapped them over the page turn. This is unfortunate that the publisher did not take into account the needs of the end users. Joining John Robinson on the byline now is Douglas Christiansen as "successor" to continue the work of updating the guide as Robinson is "advancing in age." The changes are not substantial. They have replaced two hikes (8 and 34) and altered some hikes (2, 3, 85, 88 and 90). Some of the hike titles have been shortened. Some of the hikes reflect and effects of the Curve Fire of September 2002. There are minor corrections here and there. They removed the hike to Mt. Harvard (Hike 34) and replaced it with a hike to Jones Peak via Bailey Canyon. This is a splendid trip and was conspicuously absent from earlier editions. Unfortunately they missed the mark on two counts (See my Jones Peak write-up). Wrong mileage for the Orchard Camp hike (39). They keep it at 9 miles when it is actually 7. Big mistake. Errant and confusing description of Windy Gap and the trail to Mt. Islip (Hike 76 - See the notes on my write-up). Confusing and vague description for Dawn Mine (Hike 19 - See my Dawn Mine write-up). Confusing and vague description for Brown Mountain Loop (Hike 21 - See my Dawn Mine write-up). They went back to the format of the Sixth Edition where each hike starts on a new page. Much better. At the beginning of the book they've added a list of the hikes and at the end they listed the hikes as a summary, showing difficulty, length, and type. Great! The map has been enhanced with topographical shading and an index. They set the hike titles in all caps. Harder to read. What's with the cover photo?! The old one shows a beautiful high-country scene  the San Gabriels at their best. The new one shows a brown, barren wasteland  the San Gabriels at their worst. What an unfortunate publishing decision! The page count went from 191 to 254, and the retail price went from $14.95 to $17.95. Continuously updated and in print for 35 years. It's a classic! 262 pages. 74 Photos. Retail $17.95. In spite of some quality control issues in failing to correct problems, this is still a great book. If you are primarily hiking in the San Gabriels, Robinson's book is the best choice. Note: If you already have the Seveth Edition, I suggest that you would not need to buy the new Eighth Edition. This page was last updated April 25, 2015.